“When I planted ragi, I did not do weeding. I did not water it. I did not even know people would want it for their consumption. I just put up some pictures and I had people asking for it,” says Sherpur Kalan’s Raspinder Singh practising his organic farming in Ludhiana district in Punjab. In 2017, he had six quintals of millets in a little more than half acre of his farmland. After preparing his field, he irrigated it once, did the transplantation and did not water it again. This is vastly different from Punjab’s agrarian reality where rice is predominant. 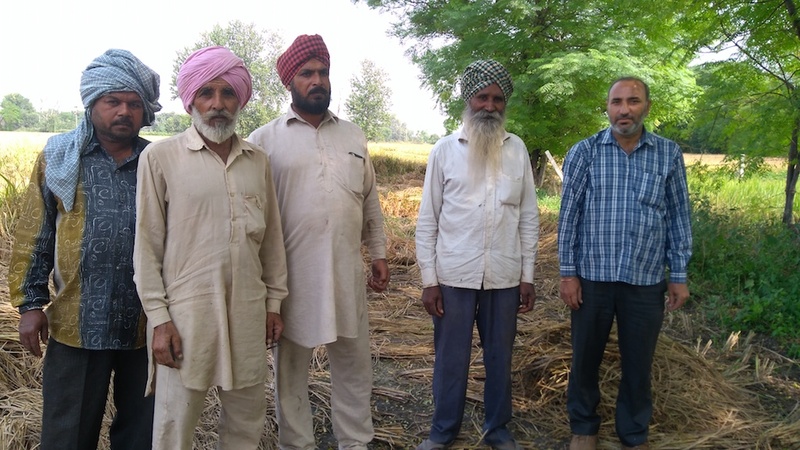 Punjab farmers are having to dig deeper and deeper for their submersibles to serve their water intensive crops. Methane emission from rice fields adds to climate warming, and the crop goes on depleting the groundwater because rice needs standing water. The government advises farmers to use water minimally but does not provide incentives for crops like millets that take little water and give high nutrition. Raspinder studied engineering and taught the subject for a year. What did it take for him to develop an interest in millets? “I had an auto-immune disease and went to Kerala for my treatment. I was asked to have ragi and eventually I got cured. I went to a conference in Indian Institute of Millets Research, Hyderabad, and got to know of how millets are used in naturopathy. In Guru Nanak Dev University in Amritsar, Punjab, I heard Professor Hardeep Singh Gujral talk about how millets benefit us. The domestic worker at my place also knew about it.” To bring back the beneficial, rich millets that everyone seemed to know of at some point but had forgotten, Raspinder decided to start growing them himself. He also distributed free seeds to interested people. Ragi is not the only healthy millet. Bajra (pearl millet) is high on energy. Foxtail is easily digestible. Rotis made from browntop millet do not get spoilt for several days. They are all fibrous and keep intestines healthy. Since they are slow in releasing carbohydrates (wheat energises the body quickly), they ward off hunger for a long time without leading to obesity. It is, however, not equally easy to grow all of these, as Raspinder discovered. Parrots feasted upon all the bajra he grew. Since farmers around him were not growing it, the birds only had this one farm to descend on to devour their favoured food. Apart from ragi, all other millets are also similarly vulnerable to attacks from different creatures. The people who had taken seeds from Raspinder are now growing their own ragi. This means there is more ragi for consumers, which is a good thing. But it also means that a bigger market is needed for producers like Raspinder, who could sell all his output last year but not this year. In talks with someone who wants to buy ragi in bulk for making malt, he had a discussion with his fellow farmers. The consensual decision was that they should at least get as much as a paddy farmer gets. Millets are not commonly grown in Punjab, not currently, at least, so there are no role models and it is all about experimenting and learning. The worker on his farm advised Raspinder to sow ragi in May. Later Raspinder saw that the yield was higher the year he had planted it around July. He then realised that since his worker is from Bihar, where monsoon arrives early, the right time for ragi in the two states would be different. He decided on the second half of June as a good time to start the plantation. Keeping a gap between the plants also gave them space to grow better and the production was higher. Apart from its low requirement of water, millets are also a kind of crop that provide the farmer with a rewarding yield, which chemical fertilisers and pesticides cannot improve further. So it is also not adding to the adverse effect of chemicals on Punjab on its water, soil and people’s bodies. Despite all its advantages, for millets to really take off and for Punjab to make a shift away from water-chemical intensive, climate unfriendly agriculture, incentives and awareness generation by the government is necessary. While the stated minimum support price for millets has been increased, like with any other crop, active procurement and distribution through government schemes is what would make the crop a popular choice for producers and consumers alike.